Jennifer discovered something freakish with our trinket snake last night: as she was shedding her skin, she was bleeding, at the midsection and further down the tail. Closer examination revealed a sizeable wound along the midsection, but I’m unable to figure out what caused it; we went over her cage very carefully and found nothing she scraped against. The blood is light in colour, suggesting that it’s capillary blood. More perplexingly, the bleeding seems to have occurred between the two layers of skin. (When snakes shed, they secrete a fluid to separate the old layer of skin from the new layer; that’s why their skin seems so dull and their eyes go milky white during this process.) 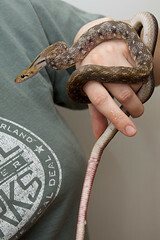 Her tail remains unshed; there’s blood underneath the unshed skin (you’ll see it in the larger versions of this photo). Jennifer examined a skin-and-blood sample under the microscope but couldn’t find any evidence of microbial infection. We’ve got her in a different, clean cage and we’re applying antibiotic ointment; if this isn’t an injury, it may well be a bacterial or fungal infection. The snake is still ambulatory and alert, but without as much muscle tension as she used to have; she’s probably quite sore, if nothing else. All in all, we’re a bit perplexed, and wondering what will happen next.